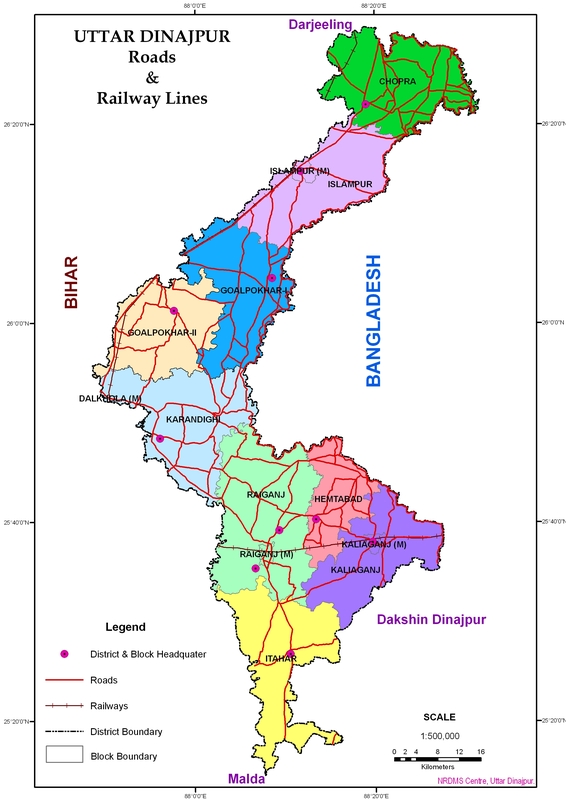 Uttar Dinajpur or North Dinajpur (Bengali: উত্তর দিনাজপুর জেলা) is a district of the Indian state of West Bengal. Created on 1 April 1992 by the division of the erstwhile West Dinajpur district, it comprises two subdivisions: Raiganj and Islampur. Uttar Dinajpur district lies between latitude 25°11' N to 26°49' N and longitude 87°49' E to 90°00' E occupying an area of 3142 km² enclosed by Panchagarh, Thakurgaon and Dinajpur districts of Bangladesh on the east, Kishanganj, Purnia and Katihar districts of Bihar on the west, Darjeeling district and Jalpaiguri district on the north and Malda district and Dakshin Dinajpur district on the south. Uttar Dinajpur is well connected with the rest of the state through National Highways, State Highways and Railways. NH-31 and NH-34 pass through the heart of the district. The regional topography is generally flat with a gentle southerly slope towards which the main rivers like Kulik, Nagar, Mahananda. The District forms a part of the basin lying between Rajmahal hills on the east. The older alluvium is estimated to be Pleistocene age. Uttar Dinajpur is bestowed with a very fertile soil. The soil is very rich in nature due to the alluvial deposition which helps to grow Paddy, Jute, Mesta and Sugarcane etc. Raiganj on the banks of the River Kulik is the District Headquarters where the "Raiganj Wildlife Sanctuary", the second largest bird sanctuary in Asia, is situated. In Uttar Dinajpur district, there are 2 sub-divisions, Raiganj and Islampur, 110 km (68 mi) apart from each other. There are 4 Municipalities, 9 Blocks and 99 Panchayats covering 1577 villages. The total population is nearly 25 lakh (2.5 million), consisting mainly of rural masses. Bengali is the main language but a sizeable number of Urdu, Hindi and Maithilispeaking people live in Islampur sub-division. The district comprises two subdivisions: Raiganj and Islampur. Raiganj consists of Raiganj municipality, Kaliaganj municipality and four community development blocs: Hemtabad, Itahar, Kaliganj and Raiganj. Islampur subdivision consists of Islampur and Dalkhola municipalities and five community development blocs: Chopra, Goalpokhar–I, Goalpokhar–II, Islampur and Karandighi. Raiganj is the district headquarters. There are 9 police stations, 9 development blocks, 4 municipalities, 98 gram panchayats and 1516 villages in this district. Other than municipality area, each subdivision contains community development blocs which in turn are divided into rural areas and census towns.In total there are 10 urban units: 4 municipalities and 2 census towns. Raiganj and Kasba form an urban agglomeration. 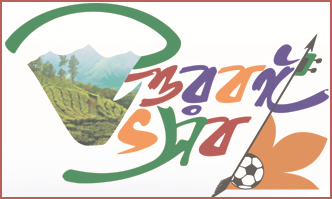 Dalkhola was a census town in census 2001, but it was promoted to be a municipality in 2003. Hemtabad (Community development block) consists of rural areas only with 5 gram panchayats. Itahar (Community development block) consists of rural areas only with 12 Gram Panchayats. Kaliaganj (Community development block) consists of rural areas only with 8 gram panchayats. Raiganj (Community development block) consists of rural areas with 14 Gram Panchayats and two census towns: Nachhratpur Katabari and Kasba. Chopra (Community development block) consists of rural areas only with 8 Gram Panchayats. Goalpokhar I (Community development block) consists of rural areas only with 14 Gram Panchayats. Goalpokhar II (Community development block) consists of rural areas only with 11 Gram Panchayats. Islampur (Community development block) consists of rural areas only with 13 Gram Panchayats. Karandighi (Community development block) consists of rural areas only with 13 Gram Panchayats.